Louisa May Alcott (November 29, 1832 – March 6, 1888), is a beloved American novelist, best known for her classic work Little Women, which she wrote in 1868. Her revolutionary views on womanhood and equality of people helped to move a nation forward in the idea that all people are created equal by God, male or female, black or white. She lived her life following the religious teachings of her parents who firmly believed in a loving God who would provide, care for, protect, and answer prayers. She took these teachings and lived her life by them, firmly advocating the right for all to have freedom to be educated, freedom to think, freedom to progress, and freedom to live lives to the fullest opportunity. Louisa May Alcott was the second of four daughters born to Amos Bronson Alcott and Abigail May. From her father she gained a strong and solid education, and from her mother, affectionately known by all as Abba, she gained an enlightened understanding of charity and Christianity. Her parents shared a mutual respect and love for each other throughout their marriage. Her father was a freethinker and her mother was a women's rights activist; both supported one another in their individual and collective activities. This strong parental relationship influenced each of their daughters to be innovative, intelligent, self-assured, and confident. Alcott's sisters: Anna Alcott Pratt, Elizabeth Sewell Alcott, and May Alcott Nieriker are the inspirations for Alcott's most famous work, Little Women. Alcott was born in Germantown, Pennsylvania on November 29, 1832. Bronson Alcott, an educator, took his small family to Boston where he established the Temple School. This was an experimental school where he could implement his novel and visionary methods. He believed that students should be involved in their individual education and enjoy the learning process. Students, therefore, spent more time than usual in nature and outside of the classroom. Because of his controversial methods, the school did not fare well. It was also at this time that he and his wife joined the Transcendentalist Movement. The Alcotts fostered a love and appreciation of nature in each of their daughters. However, during childhood and adolescence, Alcott and her family suffered from poverty and ridicule brought on by an innovative yet inconsistent provider. In 1840 the school was closed because Bronson admitted a mulatto girl for enrollment. The Alcott family moved to a small cottage along the Concord River in Concord, Massachusetts. It was here that Alcott often enjoyed visits and nature walks with Ralph Waldo Emerson, Henry David Thoreau, and other noted dignitaries of the time who were also Trancendentalists. It was the Transcendentalists’ focused values and ideas about nature that prompted the family to move to the experimental Utopian Fruitlands community for a brief interval in 1843-1844. The beliefs and actions of Bronson and Abba Alcott would cause several moves for their family over the next several years. After the Fruitlands failed, the Alcotts returned again to Concord. Alcott was well educated by her father during her youth. As she grew, she also received lessons from the naturalist Henry David Thoreau and from writers and educators such as Ralph Waldo Emerson, Nathaniel Hawthorne, William Garrison, and Margaret Fuller, who were all family friends. Looking back on her youth, Alcott later depicted these early lessons in education and the realities of Transcendentalism in a newspaper sketch entitled "Transcendental Wild Oats," which was later printed in the volume Silver Pitchers (1876). The sketch portrays the Alcotts’ "plain living and high thinking" at Fruitlands. As Alcott began to mature, she was burdened by a great sense of responsibility for her family's welfare. Due to the consistent lack of funds, Alcott felt the need to do whatever jobs she could to help support her family. She participated in domestic tasks such as reading to an elderly man and his daughter, taking in sewing and mending, and being a maid. After the failure of the Temple School and the Fruitlands community, it was up to Abba and her daughters to try and earn a living. 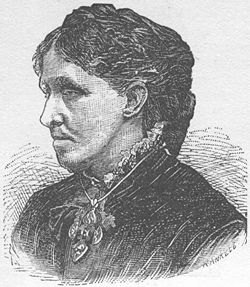 The family moved back to Boston where Abba, a known abolitionist and women's suffragist, was employed as a social worker. It was here that Alcott, along with her elder sister Anna, tutored young children for a very small income. Although Alcott detested these jobs, they provided her with a plethora of raw ideas for her future writings. Her ambitious and independent nature spurred her onward in her writing. These were the years when Alcott began to write more than just the plays that she and her sisters performed together. She began writing with the intent to publish and earn a living. Alcott published her first poem, "Sunlight," in 1852 under the pseudonym Flora Fairfield. She received a modest sum for her poem, but it was just the start she needed to begin her writings in earnest. As Alcott grew older, her ideas about life and gender took shape in the roles of abolitionist and feminist. In 1847 the Alcott family was said to have taken in a fugitive slave for a week and Alcott herself believed strongly in the equality of every human being. Her family had held to these beliefs and often suffered condemnation for their ideals. She was scorned for her belief that inter-racial marriages should be accepted, an idea that even most abolitionists did not hold. This did not deter Alcott, and she formed her own ideas about race and women from her readings and her individualized experiences. Alcott read the "Declaration of Sentiments" published by the Seneca Falls Convention on women's rights and other publications. Although her future writings would idealize the Victorian woman as a wife and mother, Alcott's own life proved to be unconventional. She never married and often wrote articles expressing her ideals that a woman should be independent both intellectually and emotionally. Three years after the success of her poem, Alcott's first book, Flower Fables (1855), was published. It consisted of tales originally written for Ellen Emerson, daughter of Ralph Waldo Emerson. The family had been living for a brief time in New Hampshire, but finally, with Abba's inheritance and financial help from Ralph Waldo Emerson, the Alcotts secured a permanent home at Orchard House in Concord. It was at this time that Elizabeth, or Lizzie, contracted scarlet fever. She was weak and sickly for two years afterwards, finally succumbing to death on March 14, 1856. Lizzie's death was very hard for Alcott to bear. Her feelings about her sister are tenderly recorded in the touching scene of Beth's death in Little Women. She dedicated more than one book to her sister, whom she referred to as "my better self." The passing of Lizzie was followed by a happier time for the family when Anna and Louisa formed the Concord Dramatic Union in 1858, where Anna was introduced to John Bridge Pratt, whom she later married in 1860. Alcott stayed at Orchard House in Concord during this time to be with her mother and provide companionship, as Abba found it hard to be parted from two of her daughters. Alcott did not neglect her writings during these eventful family years, and in 1860, she began publishing articles for the Atlantic Monthly and the more illustrious Frank Leslie's Illustrated Newspaper. Alcott was not prone to any one format. During the next several years she published poetry, short stories, melodramatic plays, fairy tales, various domestic sketches, and gothic thrillers. She also gained her first critical recognition for the sketches she wrote about the Civil War. For six weeks in 1862-1863, she worked as a nurse in the Union Hospital at Georgetown, D.C. During this time she wrote several detailed letters home recording her day-to-day observations of the soldiers and her thoughts about the war. These sketches were peppered with humor, but also a maturity that showed promise for her writing career. Her family encouraged Alcott to publish the letters together, which she did, creating Hospital Sketches (1863, republished with additions in 1869), which was published in the Commonwealth. While she was serving as a nurse, Alcott contracted typhoid fever and became very ill. At that time, the common practice was to treat typhoid with colomel, a drug teeming of mercury. This treatment would later cause Alcott's death. However, from Alcott's experiences as a nurse she was able to write and publish three anti-slavery stories where she shook up ideas on gender as her heroines worked to save the men, instead of the other way around. For the next five years Alcott wrote constantly, publishing several thrillers that are not well known to her faithful audience of Little Women. Her passionate and sensational tales were published under the pseudonym A. M. Barnard. Her novel Paulin's Passion and Punishment was published in 1863, followed by others such as A Long Fatal Love Chase. These fiery stories were known in the Victorian Era as "potboilers" or "blood-and-thunder tales" and Alcott clearly enjoyed writing them. Not only was she able to support herself and her family, she also had a good time while doing it. Alcott mocks her own writings later in Little Women where such genre of writing was referred to as "dangerous for little minds." Alcott consistently created protagonists who were headstrong, willful and persistent in their pursuit of life and what they could achieve. These relentless pursuits often meant that villains were thwarted and revenge was imminent. Alcott's works on this scale were quite enjoyable and achieved a range of commercial success. She followed that with another novel, Moods (1864), which targeted adult women, but was vastly different from the thrillers she had written earlier. With Moods, Alcott wanted to present a more mature and independent woman, free from the rigid rules placed upon them by society. She discussed a woman who could be happy whether she was married or not. It did not garner her much acclaim and she was saddened that her ideas were not more widely accepted. In 1868, Thomas Niles, Alcott's publisher, requested "a girl's story." Alcott took the next two and a half months and poured her heart and her memories into her most famous work, Little Women: or Meg, Jo, Beth and Amy, (1868). As soon as it was published on September 30, 1868, it became an instant success, selling more than 2,000 copies in the first few months. The story put four young women in the main roles, coming of age in Concord, Massachusetts. Their mother was a strong leader, and all of them worked hard to provide a living for themselves while their father was at war. The public fell in love with these little women and begged for more. Alcott thus wrote a sequel, Good Wives, (1869) which followed the March sisters in their various lives, showing Jo move to New York, Meg marrying, the enduring memory of Beth, and finally, to everyone's shock, Amy's marriage to Jo's long time friend, Laurie. Originally, Alcott did not want to have Jo marry at all, but the publishers insisted upon it, wanting Jo to marry Laurie. Alcott would not hear of this, and from this argument she created the beloved character of Professor Bhaer. The sequel rivaled the first and Alcott found herself never having to worry about finances again, with it selling over 13,000 copies immediately. Alcott wrote Little Men (1871), a heartwarming tale of the adventures that befell Jo and Professor Bhaer when they open up their home as a school to a group of rowdy boys. All of the characters were revisited for the last time with the final installment in the "March Family Saga," Jo's Boys (1886), which continues on with stories of the education of the boys and the trials and joys of growing up. With her new star status, Alcott and her sister May left for Europe and traveled extensively, but even while she was gone, her reputation grew as book after book was published and widely read. Alcott also wrote one more novel for adults. Work was published in 1873 and detailed her experiences trying to provide an income for her and her family at the various jobs she did while growing up. It was also during this time that she became more serious about participating in the women's suffrage movement. She wrote several articles for The Woman's Journal and even went door-to-door encouraging women everywhere to get out and fight for their right to vote. In 1879, Alcott became the first woman registered to vote in Concord. Although Alcott's success was immeasurable at the time, it was dampened by the passing of Abba in 1877. Alcott's success continued with the publication of An Old-Fashioned Girl (1870), Aunt Jo's Scrap Bag (6 vols., 1871–1879), Eight Cousins (1874) and its sequel Rose in Bloom (1876), and others. These moral and altruistic novels were popular with her loyal and adoring fans. Sad times were often mixed with happy occasions in Alcott's life. After the passing of Abba, Alcott helped celebrate the marriage of her sister May, to a wealthy European, Ernest Nieriker, in 1878. May and Louisa often competed in their various endeavors, and both were driven by ambition and a willful spirit. May was an artist from her youth and spent time studying in Europe, having several paintings displayed in various salons. In November 1879, May gave birth to a baby girl she named after her beloved sister, Louisa May Nieriker ("Lulu"). Sadly, May suffered from complications and died six weeks later. Her last wish was that her sister raise Lulu, as she knew that Alcott would love her as she herself would have loved her. Thus, Lulu was sent to Alcott and she raised her as her own. Lulu brought a happiness and fulfillment to Alcott's life that cannot be measured. During these last years, Alcott's health began to seriously decline and she suffered from the slow effects of mercury poisoning contracted during her Civil War service. Throughout all of this time she still kept writing and publishing. Along with caring for Lulu, she had also cared for her father since her mother's passing. On March 4, 1888, Bronson Alcott passed away and two days later on March 6, 1888 Alcott died in Boston. She was only 56 years old. Her legacy is undeniable; she remains today one of America's best-loved writers. 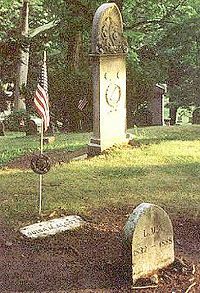 Alcott was buried in Concord next to several of her friends, including Nathaniel Hawthorne, Henry David Thoreau, and Ralph Waldo Emerson. The story of Louisa May Alcott has been told by various women. Ednah D. Cheney was the first to attempt Alcott's history in her book, Louisa May Alcott: Her Life, Letters and Journals (Boston, 1889). Madeleine B. Stern also wrote a biography titled Louisa May Alcott (University of Oklahoma Press, 1950). Newer biographies include Louisa May Alcott: A Modern Biography by Martha Saxton. Shealy, Daniel (ed.). 2005. Alcott in Her Own Time: A Biographical Chronicle of Her Life, Drawn from Recollections, Interviews, and Memoirs by Family, Friends and Associates. Iowa City, IA: University of Iowa Press. ISBN 087745938X. History of "Louisa May Alcott"
This page was last modified on 26 July 2018, at 15:30.